Ethnic Ethos - A Collection Of Festive Ghagras And Sarees is an event that took place between 12-Sep-2006 and 25-Sep-2006 in Hyderabad. Sarang, the sari boutique at Road No. 10, Banjara Hills, is holding an exhibition and sale of traditional designer collections of ghagras and saris for the festival season, titled The Ethnic Ethos, for a fortnight. This collection of Rekha Lahoti's classy and exquisite collection has no repeated patterns, designs or colors. Every creation is exclusive, significantly different from others, and stands out in a class of its own. Sarang has a vast range of ghagras, saris, stoles, casuals-tunics, kurtis, blouses and salwar-kameezes among its latest designs. The latest addition is partywear and casualwear for kids aged 4 years to 15 years, for pre-teens and teens. Apart from women’s wear, there are also a wide variety of shirts on display, both formal and casual. Keeping in mind the early onset of autumn/winter, the collection uses a mix of silk, jacquards, linens, and cotton fabrics for shirts, with emphasis on whites, adding a dash of embroidery and patchwork, and making them stylish yet comfortable. The boutique will also be open on Sundays. Rekha Lahoti, a young fashion designer from Hyderabad, has carved a niche for herself in the fashion industry. A degree in Fine Arts from Kolkata, and a natural flair for art, were the perfect ingredients helping her put together her explosive yet subtle designs for saris. More than a decade has gone into this art, and has enabled her to put her own stamp of styling into both ethnic and contemporary wear. 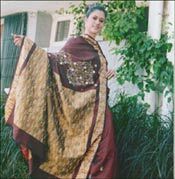 She’s worked on a wide range of collections, the most innovative being her creation on Kanchi Silk. She pioneers in blending weaving and embroidery on Kanchi Saris, which has been widely appreciated. She had designed for the Mrs India contestants contesting for the Mrs World 2003 pageant at Los Angeles. She has also participated in various fashion events nationally - to name a few, DSYN 2004, Femina Bridal, Femina Clothes and the NIFT Show. She's successfully been running Sarang, her signature store, at Banjara hills. Please contact Rekha Lahoti at 6682-2121/6656-4477, for further details. Be the first to comment on Ethnic Ethos - A Collection Of Festive Ghagras And Sarees! Just use the simple form below. fullhyd.com has 700,000+ monthly visits. Tell Hyderabad what you feel about Ethnic Ethos - A Collection Of Festive Ghagras And Sarees!